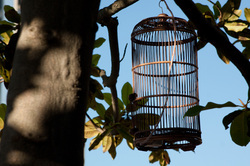 Formerly called "Imaginary Birds", these invented birds are placed in bamboo birdcages which then resonate with their invented sound, musical compositions that follow the rules of bird communication, yet are original in conception. And according to the way our real biome is sonically shaped, all the sounds mesh together in a perfect puzzle-like counterpoint, providing the perfect complement to your garden or home. Birds of Invention was first implemented in Spring 2013 as an educational project in the City of Oakland in collaboration with artist Kristi Holohan, through MetWest High School and Dimond Recreation Center, with financial support from the Anonymous Fund of the East Bay Community Foundation. Kids were invited to construct their own invented birds from found materials, and were taught the principles of bird communication in order to invent their own song from found sounds of their own Oakland neighborhoods. An 'Invention' is a musical form, a bit like an etude, which usually explores counterpoint between two or more voices. JS Bach was the most memorable practitioner of the two-part invention musical form, in his Inventions for piano. I adopt this title to indicate the contrapuntal interplay between two birds happily twittering while they perch on tree branches. The birdcages provide a unifying visual element for the invented birds, and also a convenient way to produce their song, as the bottom surface of the cage serves as a resonator for the attached transducer. The Birds of Invention are available individually as a standalone, battery-powered art piece, or as a set with master computer control for a complete multivoice backyard installation. They are available in indoor or weatherproof configurations for year-round use. Here are some birds we have invented (sound clips on the way! ): Greater Breadnought, Flarling, Geoffrey’s Knuttel, Spotted Glicken, Lesser Frodnilly, Smeller, Trytlle, Yellow Quirksey, Northern Froller, Graylet, King's droppler, Black and Blue Sarligee, Red-backed Drapple, Pelagic Troper, Western Grandfry, Writtit, Livingston’s Proble, Coxxen, Laffwit, Coral-winged Kraker, Zoolodad, Gray’s Brenting, Yellow-capped Snaggler, Towhit, Eastern Blenger, Triffin, Audubon Gridley, California Tuolumnar, Fredling. Hypothetical Bird demo: Caponi Artpark from Livingston Sound on Vimeo.